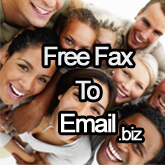 Q: Where do I sign up for a free fax to email number for Gmail? Q: How long does it take before I can receive faxes for Gmail? What you need before you start : Your gmail email address - to receive your faxes. If you fail to see the fax in your inbox, click "spam" and look for the email in there. Click the email to view it and click "NOT SPAM"
Select "Add to my contacts"
Type in the email address from which the fax orginated from.